An application to help you arrange your furniture… with a 3D preview feature! Convert pretty much anything into many other things. Play Asteroids against anyone in the universe! There is a creature in nature that has a second set of jaws, just like the monster in Alien. And this was only discovered recently. Nearly-obligatory political link of the week. Anti-war and such. Any Questions? And don’t forget the Twitter. Add me and my friends and get updates through your IM client. "Be sure to sample our selection of flavored salts, and please await the water sommelier: A chef who offers anything other than sea salt probably refers to himself in the third person. When the water sommelier comes over, I reach for my gun." I think I love Anthony Bourdain. Not true -- it does unit conversions as well. But I often use Google for that, which is one of the things I love about Google. Aw, come on, J. 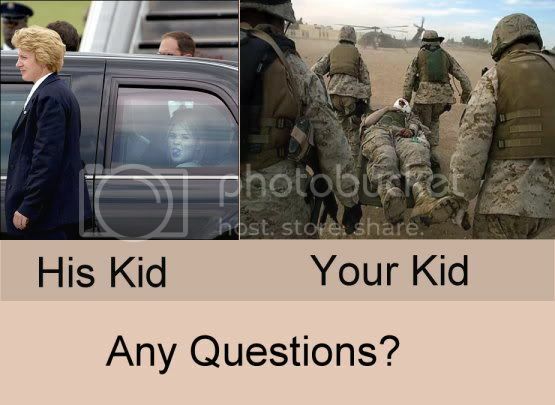 The 'his kid vs. your kid' thing is so unfair. She really has grown as a person. She is much more intelligent, rational, and reasonable these days. She has learned from her mistakes. Sadly, that is MUCH more than we can say for her father, who is not any more intelligent, who is not rational or reasonable, and who CERTAINLY has not learned from his mistakes. Maybe SHE ought to run for president in sixteen years? I guess you're right. Some things are just unfair.